Increasing prevalence and recurrence rate of kidney stones globally is set to accelerate the kidney stone management market in the coming years. According to the National Kidney Foundation, over half million people go to emergency rooms for kidney stone problems every year. Remarkable increase in number of kidney-related diseases and other urological conditions affecting population has generated need to create awareness regarding overall kidney health, and timely screening and diagnosis of disease to receive appropriate treatment. Initiatives undertaken by various organizations such as International Society of Nephrology (ISN) and the International Federation of Kidney Foundations (IFKF) for raising awareness regarding affordable and equitable access to screening, diagnosis and treatment options will positively influence kidney stones management industry growth in forthcoming years. Growing inclination of people towards minimally invasive surgeries for kidney stone management is another positive impact rendering factor that will augment the business growth. Treatment of kidney stones using minimally invasive procedures such as laparoscopic, robotic, percutaneous and ureteroscopy surgeries has gained popularity over the last few years. Various hospitals are significantly investing in employing minimally invasive surgical procedures for kidney-related diseases such as tumors, kidney stones, and removal of poorly functioning kidneys. The advent of these procedures has revolutionized the field of kidney stone treatment due to benefits offered such as shorter hospital stay, fast recovery, less traumatic pain, and fewer pain medicines. However, lack of treatment awareness in underdeveloped countries as well as potential long-term adverse effects of lithotripsy may impede kidney stones management industry growth during the analysis timeframe. Calcium oxalate segment held highest revenue share of more than 75% in 2017 an is estimated to witness robust growth over the coming years. High segment growth is attributable to low fluid intake and consumption of diet containing high levels of protein, oxalate, sodium or sugar. Moreover, rising prevalence of obesity and other medical conditions among population will further favor segment growth. Ultrasound segment accounted for significant revenue in 2017 and is anticipated to witness 5.4% CAGR over the forecast timeline. Ultrasound is a significant imaging modality that is gaining momentum for kidney stone diagnosis and is recommended to be first-line diagnostic technology for young and pregnant patients. Efficient diagnostic ability of ultrasound as compared to CT scan for detection and sizing of small stones will escalate the segment growth in coming years. Extracorporeal shock wave lithotripsy segment was valued at 918.3 million in 2017 and the segmental growth can be attributed to the growing inclination of people towards minimally invasive procedures for kidney stones management. Extracorporeal shock wave lithotripsy (ESWL) is a noninvasive treatment modality that offers less discomfort as compared to other treatment options. Technological advancements such as reduction in size of these devices occupying less space with more efficient targeting systems such as electromagnetic and piezoelectric sources to deliver accurate energy to stones will further upsurge kidney stones management industry growth. U.S. ement market dominated North America region and was valued at USD 634 million in 2017 and is estimated to show similar trend over the forecast period. High revenue growth can be attributed to the awareness among patients regarding kidney health as well as favorable reimbursement scenario for kidney stone management. Moreover, better access to technically advanced disease management options such as ureteroscopy and minimally invasive surgeries should further lead to U.S. kidney stones market growth. 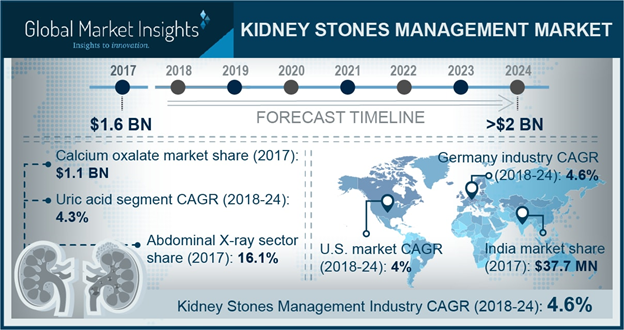 Germany kidney stones management market is estimated to show robust CAGR of 4.6% over the forecast period. Rising prevalence of kidney stones coupled with adoption of advanced technologies such as flexible ureteroscopy in the country will favor kidney stones management business growth. Moreover factors such as increasing trend of hypertension, diabetes and obesity due to unhealthy diet and lifestyle changes may favor kidney stone formation thereby fostering the industry growth. Some of the notable industry players operating in the kidney stones management market include Allengers Medical Systems, Boston Scientific, Coloplast, Cook Medical, C. R. Bard, DirexGroup, Dornier MedTech, Elmed Medical Systems, EDAP TMS, Karl Storz, Medispec, Olympus, Richard Wolf and Siemens Healthineers. These industry players implement certain strategic initiatives such as new product launch, mergers and acquisitions that help them to strengthen their market position and capitalize on market opportunities. For instance, in April 2018, Olympus Corporation signed an agreement to acquire lithotripsy system design and production technology from Cybersonics Inc., thereby enabling the company to improve its clinical outcomes, reduce costs and improve efficiency. The strategy also aimed at enhancing company’s product portfolio and broadening its customer base.